Winner of the National Book Award: The definitive history of Joe McCarthy, the Hollywood blacklist, and HUAC explores the events behind the hit film Trumbo. Drawing on interviews with over one hundred and fifty people who were called to testify before the House Un-American Activities Committee -- including Elia Kazan, Ring Lardner Jr., and Arthur Miller -- award-winning author Victor S. Navasky reveals how and why the blacklists were so effective and delves into the tragic and far-reaching consequences of Joseph McCarthy's witch hunts. 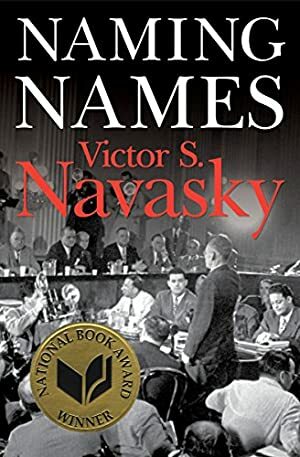 A compassionate, insightful, and even-handed examination of one of our country's darkest hours, Naming Names is at once a morality play and a fascinating window onto a searing moment in American cultural and political history. Log In to track Victor S. Navasky on eReaderIQ. to be notified each time the price drops on any book by Victor S. Navasky. to stop tracking Victor S. Navasky. We started tracking this book on September 30, 2013. The price of this book has changed 106 times in the past 2,030 days. The current price of this book is $2.51 last checked one day ago. The lowest price to date was $0.99 last reached on September 5, 2017. The highest price to date was $17.99 last reached on May 8, 2018. This book has been $17.99 3 times since we started tracking it. We last verified the price of this book about one day ago. At that time, the price was $2.51. This price is subject to change. The price displayed on the Amazon.com website at the time of purchase is the price you will pay for this book. Please confirm the price before making any purchases.